Even into the 1980s, film and developing cost quite a bit of money. Practically everyone owned cameras but they tended to use them sparingly. 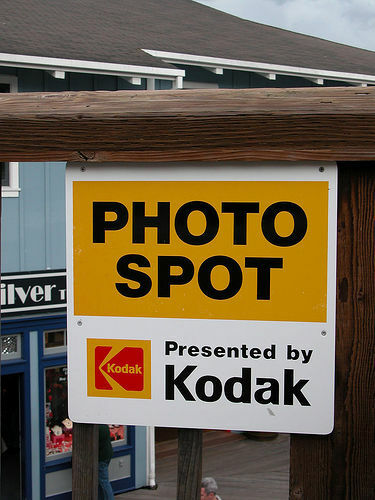 So Kodak put these Picture Spot signs in national parks and, most notably, Disney theme parks to remind people to use their cameras. Let’s put this in 2015 marketing terms. Most of Kodak’s target consumers had mobile devices (on multiple platforms [i.e. cameras] but mostly running the same software [i.e. film]), so they needed to focus on increasing actual usage. Thus they placed these ads at key usage locations. Many of today’s app makers could benefit from the Picture Spot approach. Obviously, the Instagrams of the app world might benefit from reminding users to post pictures in scenic places. But couldn’t a travel app posts signs in airports reminding users to check the apps for flight changes? Couldn’t a recipe app place reminders in supermarkets to see what they could do with, say, a bunch of leeks? This entry was posted in Digital Marketing and tagged camera, disney, instagram, kodak, mobile marketing, picture spot on September 22, 2015 by Ben.